The Peanuts comic-strip, by Charles M. Schulz, is a truly iconic part of the art-form. Readers of various ages are surely familiar with the adventures of Peanuts, Charlie Brown and company, and it's not surprising that celebrations are due for its 65th anniversary. A big part of the celebrations will be a new feature film, The Peanuts Movie, which is the first film for the IP in decades. It's hard to tell whether it'll do the original Schulz work justice, but it'll be a money-spinner when released on 6th November; naturally, then, there'll be an accompanying game. 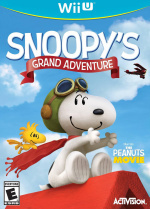 The Peanuts Movie: Snoopy's Grand Adventure will be released on the same day as the movie, and has been confirmed to include Wii U and 3DS in that release slate. A platformer with a two-player co-op option, it seems to have a nice visual style that, to our eye, has a hint of the clay-based approach seen in Kirby and the Rainbow Curse. The second player will fly and assist as Woodstock, rather than run around with Peanuts. The game will feature some of the film's voice cast and looks pretty reasonable in the launch trailer - check it out below and let us know what you think. But, yeah it looks adorable, and the graphics aren't bad at all. This will surely be game of the year. Strange to go for that kinda Kirby and the 'Rainbow Curse' clay looking style in this particular game, given the upcoming film is done in a very different and very aesthetically pleasing style, but it looks half decent. wait a sec PS4 but no PS3 yet we get both xBoxe's... whats wrong with them??? Also no Wii or DS, but does anybody even make DS games any more? If I get to hear the theme song as I play it'll be worth it for that alone. The platforming actually doesn't look too bad. This is just a movie tie-in game. There was no interest in making a Peanuts game before the movie so I have no confidence that this will be even half-decent. Unfortunately. If this game legit features Vince Guaraldi's legendary jazz compositions, I am so there! It fits a nice bit of heady platforming like a charm... And I should know! I'm getting a massive Yoshi's Island vibe from this, and that's no bad thing. Well at least it is on a ton of platforms. I'm always mildly sceptical about movie tie in games, but this looks fun so far. I think provided the game captures some of the charm from its source material, and doesn't turn into another bare bones, by the books platformer, it could be a lot of fun, especially for fans. I've LOVED Peanuts as a kid (currently 33), and I even remember the Peanuts games for the Original NES! This looks okay. Can't wait to try it. Love the art style, but it seems like it could end up being another generic platformer. I would've loved to see a sequel to Snoopy vs. the Red Baron. @AlexOlney, I got the same vibes here. It reminds me of the 90's when Disney released an amazing film AND an amazing game - like Aladdin and The Lion King on the SNES. Those times should come back. I'm half expecting this to be decent, along with Adventure Time: Jake & Finn Investigations. What can I say, I still remember the time when licensed games were actually awesome. Concerning the titel of the news: Since peanuts aren't nuts but legumes, no person with just a nut allergy would ever have any problem with them. You would need a peanut allergy for that. @daniruy Aladdin on SNES being "amazing"? Yeah, right. Then what is a mediocre platformer if Aladdin (the SNES one) is amazing? Did not expect to want to play this after watching the trailer. Definitely hyped for the movie, but obviously I'll most likely pass on this game. 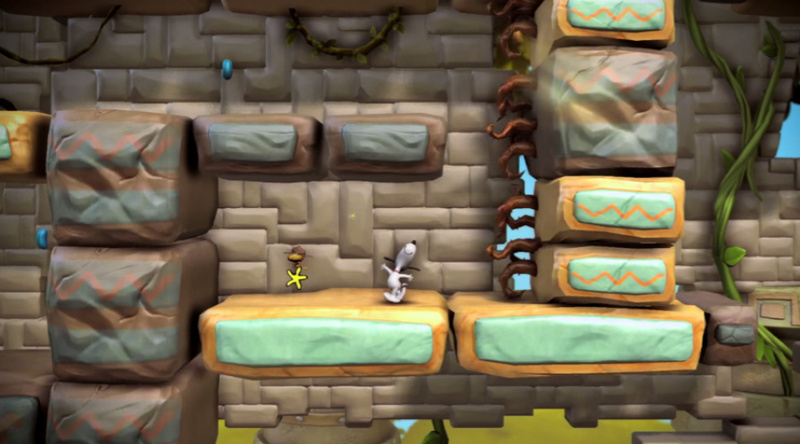 It just looks like your average platformer. Would be great if it turned out to be something really good though! I'll get it when it's price is reduced to $15 dollars. It's weird that it's available for the Xbox 360, Xbox One, Wii U and 3DS but Sony only has it available for the PS3. This actually looks somewhat decent, unlike some of Acitivision's other licensed titles that have survived. @marnelljm - "Looks like an extremely generic platformer to me"
I'm glad somebody said it. B/c that's probably what PS4 and X1 owners say every time they see another Nintnedo IP 2D platformer like DK. Yoshi, or Kirby. @ManateeBlubber no... Smurfs by Ubisoft! Ack! @KodyDawg a gamer after my own heart! Snoopy vs. Red Baron was all kinds of fun, and with this today's technology... It. Would. Be. Awesome! @rjejr holy carp! I just noticed, you're 50! you look much younger than your avatar... Happy Belated Birthday! RE: Generic Platformers.... Yeah, my friends say that all the time, both PS/XB players. Oh wow, the graphics are very nice. And I like the Woodstock coop. I wish the level design was more peanuts and less generic "world travel". WOODSTOCK !, DAY ONE PURCHASE - PLATFORM : 3DS..
@Platypus101 Right?! Gyro controls would be a godsend. Love these fan service titles. Brings back nostalgia for the old NES/SNES titles. I'm buying it. TOTALLY BUYING THIS, I DON'T CARE HOW BAD THE GAME IS!!! They rarely made any Peanuts video games over the years. Aww, it looks adorable! 3DS or Wii U version for me I think! There've been good Peanuts games before, especially the Snoopy Flying Ace ones, so I'll be as least mildly optimistic for this one. @KeeperBvK "Then what is a mediocre platformer if Aladdin (the SNES one) is amazing?" The Genesis version, of course! I'm feeling that this will be a pretty decent but somewhat easy game. Probably a good licensed game though. I hope everyone figured out I was just teasing before. I'm a huge Peanuts fan, Snoopy and the Red Baron on the PS2 and Snoopy Tennis GBC those were some of my favorite games back in the day. Hell I might pick this up on day-one so i can have a light hearted stroll through Schulz's world, before Fallout 4. Snoopy Flying Ace was a great game, I will keep an eye o n this and check reviews. A budget title that looks decent. Reminds me of Garfield's Nightmare on the DS in terms of quality. Will check out in November! @Seanmyster6 @KeeperBvK I was about to say, must have mixed up the SNES and Gens/MD versions of Aladdin. I had the Gens version growing up and I always got confused when the game wound up on so many lists of great games around the time we got internet, not knowing until much later that the SNES version was much better. I miss Capcom Disney games. @Platypus101 - Not my birthday yet, I'm celebrating the birthmonth, and i couldn't find a cake that looked any younger than that, kind of looks more like a wedding anniversary than birthday now that I look at it. And thanks. I love Snoopy and I can't wait to play it for my birthday!